Heat oven to 350°F. 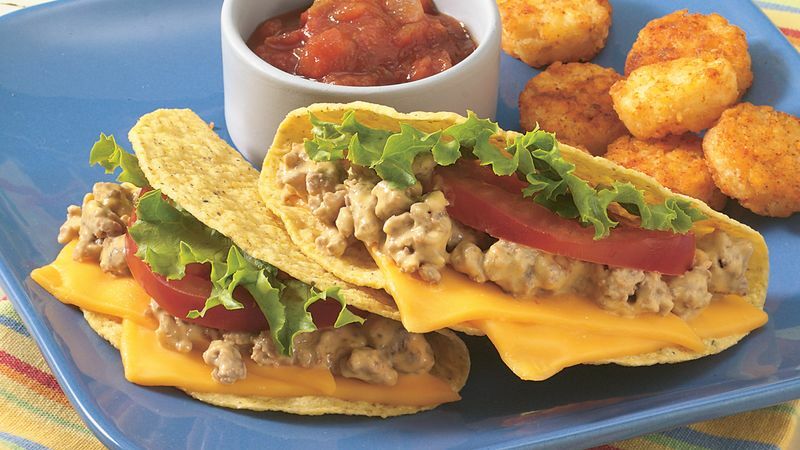 Line each taco shell with 1 slice of cheese. Arrange taco shells on ungreased cookie sheet (cheese will fall to one side). Bake 5 to 7 minutes or until cheese is melted. Meanwhile, in 10-inch skillet, cook beef over medium-high heat 5 to 7 minutes, stirring frequently, until thoroughly cooked; drain. Stir in dip. Cook until hot. To serve, spoon about 2 tablespoons beef mixture into each warm taco shell. Top each with lettuce and tomato. Serve with salsa. Die-hard cheeseburger fans can add pickle slices to their tacos. To keep stove cleanup to a minimum, purchase a splatter screen. The round mesh screen sits on top of the skillet, minimizing the splatters you typically get when cooking ground beef. Look for a splatter screen in the housewares department of discount stores.